Meet Bernard Minier, one of the most applauded contemporary French crime novelists and discover his best-selling novel, Night, just launched in the UK by Mulholland Book Trade Paperpack. Night follows detective Kirsten Nigaard and commandant Martin Servaz on a terrifying chase. 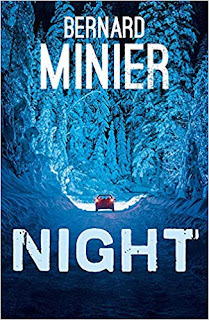 Winner of the prestigious Prix Polar at the Cognac Crime Festival and translated into twenty languages, Bernard Minier became a sensation in France when his first novel Glacé (The Frozen Dead, 2013) was published. It was made into a very successful television series now available on NETFLIX. Chaired by Ayo Onatade, freelance crime fiction critic and Associate member of the Crime Writers Association of Great Britain. When a body is found in a church in the far north of Norway, the trail leads to an offshore oil rig. Searching the rooms of one of the rig workers, detective Kirsten Nigaard finds a pile of photos taken with a long-lens camera. The subject of the photos is Martin Servaz. And someone has been watching him. Signs suggest the killer is none other than Julian Hirtmann, a serial murderer on the run. Martin, after all, has a long and painful history with Hirtmann. Now it seems he has struck again. Their one clue is in amongst the photos. A picture of a young boy in a beautiful Austrian village, and on the back of it, the name 'Gustav'. Martin and Kirsten set off on the trail and soon find themselves in a terrifying cat-and-mouse chase, not knowing who is chasing whom, and which of them might pay the ultimate price.